Short introduction in Norwegian: I anledning at jeg deltok i en episode om mirakelfrukt på Schrödingers katt på NRK (og YouTube) publiserer jeg to blogginnlegg om temaet. Det første innlegget handler om smakstesting av mirakelfrukt. Innlegget nedenfor er del 2 av 2 og er en samling fakta om mirakelfrukt med referanser til forskningslitteratur. Siden denne bloggen normalt er på engelsk fortsetter jeg herved på engelsk. It is important to note that scientific results are not necessarily equal to "facts" or "absolute truth" but rather the best knowledge we have thus far. This tentative nature is inherent in science. When I have used the word “facts” it should hence be interpreted as published scientific results. You might observe that some statements below seem to contradict each other. The reason for this may be that more recent research has corrected older incomplete results, or that two studies might come to different conclusions. These things occasionally happen in science and are perfectly natural parts of science in general. The information was collected from scientific papers during 2011, so it might (most likely) exist research published late 2011 or in 2012 which has escaped me. The effect wears off with time, typically 30 minutes to one hour depending on amount taken. 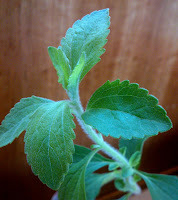 Gymnema silvestre (another taste modifier which removes sweet taste) removes sweet taste-induced by miraculin (Bartoshuk, 1974) [my comment: I’m uncertain whether the mechanism of both substances are known in sufficient detail to explain this. Also, there might be problems in calibrating the appropriate amounts; how much Gymnema Silvestre do you need to accurately counteract a certain amount of miraculin?]. Note: The following list is not complete, just a selection of relevant substances that I collected in the process. Bartoshuk, L. M. (1974). After-Dinner Talk - Taste Illusions: Some Demonstrations. Annals of the New York Academy of Sciences, 237(1), 279-285. Capitanio, A., Lucci, G. and Tommasi, L. (2011). 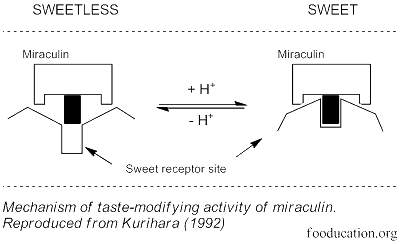 Mixing Taste Illusions: The Effect of Miraculin on Binary and Trinary Mixtures. Journal of Sensory Studies, 26(1), 54-61. Gibbs, B. F., Alli, I. and Mulligan, C. (1996). Sweet and taste-modifying proteins: A review. Nutrition Research, 16(9), 1619-1630. Hirai, T., Fukukawa, G., Kakuta, H., Fukuda, N. and Ezura, H. (2010). Production of Recombinant Miraculin Using Transgenic Tomatoes in a Closed Cultivation System. Journal of Agricultural and Food Chemistry, 58(10), 6096-6101. Inglett, G. E., Dowling, B., Albrecht, J. J. and Hoglan, F. A. (1965). Taste Modifiers, Taste-Modifying Properties of Miracle Fruit (Synsepalum Dulcificum). Journal of Agricultural and Food Chemistry, 13(3), 284-287. Kant, R. (2005). Sweet proteins - Potential replacement for artificial low calorie sweeteners. Nutrition Journal, 4(1), 5. Kurihara, Y. (1992). 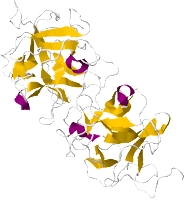 Characteristics of Antisweet Substances, Sweet Proteins, and Sweetness-Inducing Proteins. Critical Reviews in Food Science and Nutrition, 32(3), 231-252. Kurihara, Y. and Nirasawa, S. (1994). Sweet, Antisweet and Sweetness-Inducing Substances. Trends in Food Science & Technology, 5(2), 37-42. Liu, C., He, C., Xie, T., Yang, Y. and Liang, T. (2011). 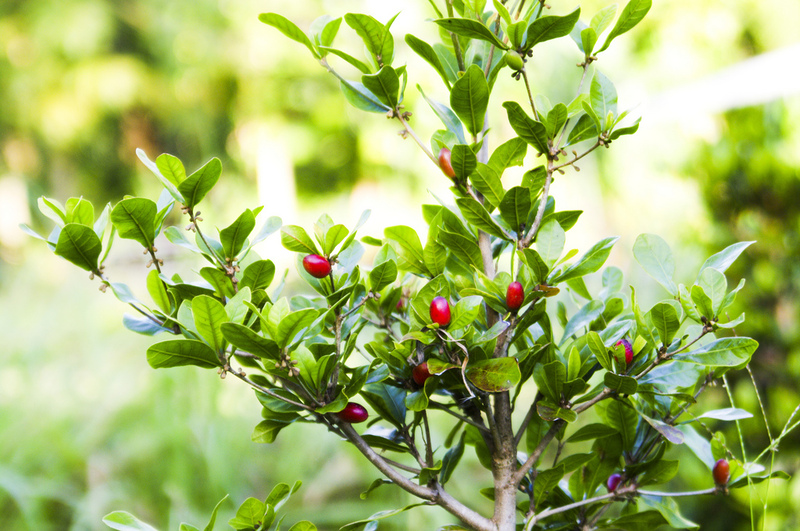 Research on Preservation of Synsepalum Dulcificum by Coatings. Advanced Materials Research, 239-242, 2158-2162. Okubo, S., Asakura, T., Okubo, K., Abe, K., Misaka, T. and Akita, T. (2008). Neoculin, a taste-modifying sweet protein, accumulates in ripening fruits of cultivated Curculigo latifolia. Journal of Plant Physiology, 165(18), 1964-1969. Paladino, A., Colonna, G., Facchiano, A. M. and Costantini, S. (2010). 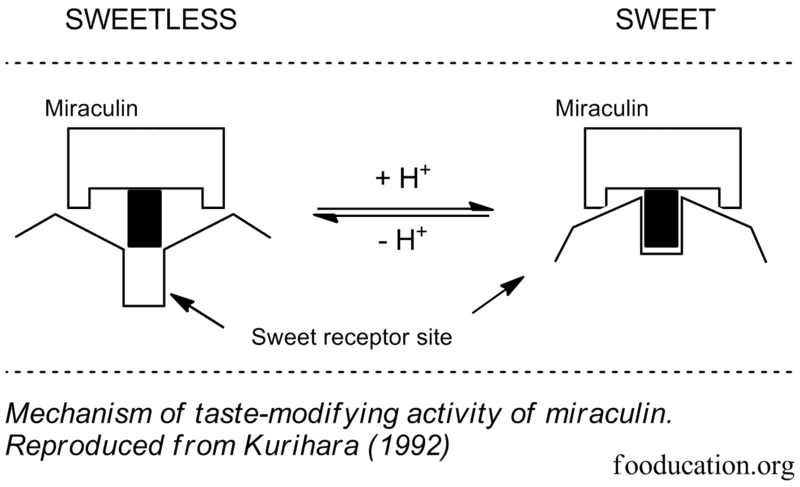 Functional hypothesis on miraculin' sweetness by a molecular dynamics approach. Biochemical and Biophysical Research Communications, 396(3), 726-730. Peregrin, T. (2009). 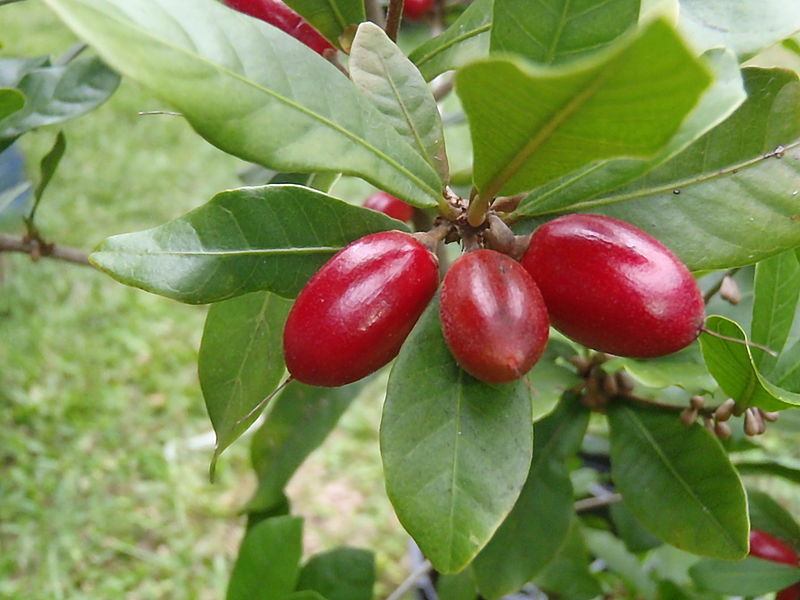 "Miracle Fruit" May Be a "Sweet" Alternative for Cancer Patients. [News Item]. Journal of the American Dietetic Association, 109(6), 974-975. Shimamura, M. and Lin, M. L. (2007). 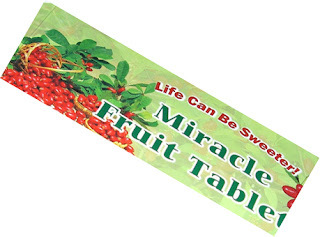 Establishment of technology on miracle fruit tablets and its applications. Chemical Senses, 32(2), 6. Wong, J. M. and Kern, M. (2011). Miracle fruit improves sweetness of a low-calorie dessert without promoting subsequent energy compensation. Appetite, 56(1), 163-166. Yamashita, H., Akabane, T. and Kurihara, Y. (1995). 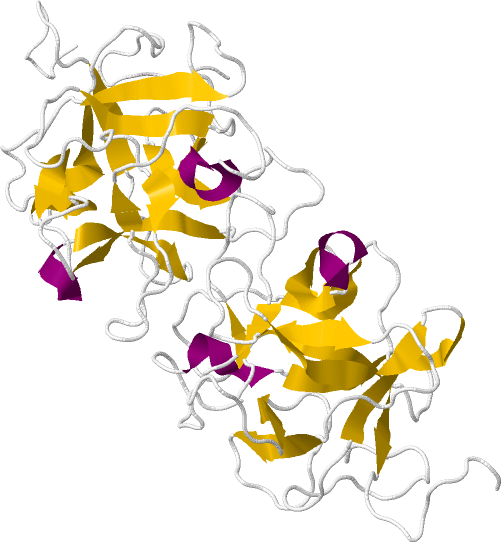 Activity and Stability of a New Sweet Protein with Taste-Modifying Action, Curculin. Chemical Senses, 20(2), 239-243. Yano, M., Hirai, T., Kato, K., Hiwasa-Tanase, K., Fukuda, N. and Ezura, H. (2010). Tomato is a suitable material for producing recombinant miraculin genetically stable manner. Plant Science, 178(5), 469-473. * Numbers based on ISI Web of knowledge search containing one or more of the following key words: miraculin, miracle berry, miracle fruit, synsepalum dulcificum, richadella dulcifica. What a wonderful article with some great information on the Miracle fruit, it's effects and properties. Thanks for this. Thank you for this informative article. Very helpful because I am doing research in transgenic tomatoes expressing miraculin. Could you tell us why don't we have already GM tomatoes expressing miraculin if it has already proven to be feasible? Thanks!! Great information, sadly the statut of novel food in EU doesn´t allow us to grow the miracle fruit. Do you think we can change that in a short time? "There was a request whether this product requires authorisation under the Novel Food Regulation. According to the information available to Member States' competent authorities, this product was not used as a food or food ingredient before 15 May 1997. Therefore, before it may be placed on the market in the EU as a food or food ingredient a safety assessment under the Novel Food Regulation is required."